When Thistle signed Tom Hyslop from Rangers in July 1900 few people realised that he was living a double life. He was born Bryce Scouller, and adopted the name Hyslop for his football career, initially to leave behind his original career as a yound soldier. 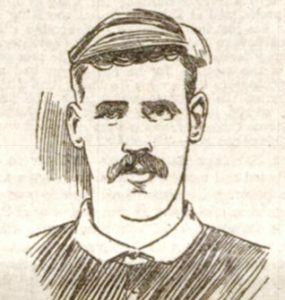 The footballer Hyslop had already had a successful career before he joined his new club at Meadowside, having played for Sunderland, Stoke and Rangers (winning the Scottish, Glasgow and Charity in 1896-97) and being capped twice for Scotland against England. He was nicknamed ‘Long Tom’ because of his penchant for shooting from distance. He joined Thistle and played regularly as an inside left or left half, playing 24 times and scoring ten times in 1900-01. He left the club before the end of the season, re-joining the army and serving in the Boer War. When the season ended no other player had scored as many as Tom had. On his return he had spells with Dundee Wanderers, Johnstone and Abercorn before emigrating to America.